While Mike explored Japanese culture this week, I ventured out to my first movie date with two more trailing spouses from the AWA. One woman, Anne, plans a movie/lunch outing monthly and then emails the “movie group” with details and a brief synopsis of the movie. The mix of women in the AWA is more international than I first thought. Anne was born in Taiwan (half British, half Taiwanese) but raised in Ohio. She’s married to a Brit and has two small children born in Singapore. When they finally leave Singapore, they plan to return to the UK. The other woman, Claire, (half Russian, half Taiwanese) and her husband both worked for the IMF (International Monetary Fund) in DC and came to Singapore for just a year. . . 11 years ago! She says she fell in love with Singapore after two years, and now thinks they’ll stay here permanently. What attracted both of these women to You are the Apple of My Eye is that it was made and set in Taiwan. What attracted me was the chance to go to a movie and meet some more people while Mike is in Japan. As with most things here, I had little idea what to expect. I’ve gotten pretty good on the buses now that I’ve discovered www.gothere.sg and Google Maps on my phone to locate myself and bus stops. I had no trouble finding the Cineleisure Orchard, a glitzy complex of small retail and eating venues, karaoke, e-gaming, and the main attraction, the “movie halls” on levels 4- 7 and 9. I could see this being a crazy mecca for 13-20 year olds on weekends, but fortunately, it was pleasantly empty on Monday at 10:30 am. We three met up at the box office, and the tickets were just S$7 for this a.m. showing. You select your seats from a map, and we got great ones since there were only about 20 people in the theater. Based on a true book, the movie was a nostalgic coming-of-age comedy about a group of friends’ maturing and first love. It was in Mandarin, and Anne (fluent) was always laughing long before me as I was struggling to keep up with the English subtitles. It had elements of Animal House (NOT my favorite parts! ), but thankfully ended in a wistful, sophisticated, and not predictable way. For me, the universal aspects were the best—yes it was set in modern Taiwan with a lot of incomprehensible (to me) talk, but the characters’ stories and feelings rang true for all three of us. Afterwards, we walked next door to the Mandarin Gallery (mall attached to a hotel) for lunch at Jones the Grocer (a well-known chain here –an upscale café set inside a small gourmet food market). 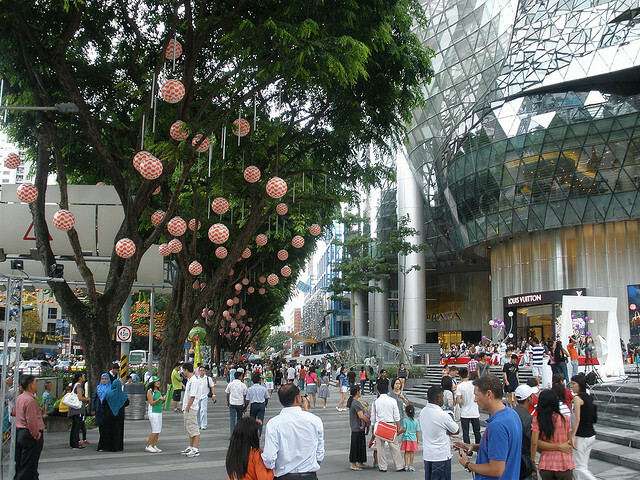 I should mention that all the AWA women that I’ve met seem to live and hang out near Singapore’s famed “Orchard Road” shopping/hotel/entertainment extravaganza. It’s blocks worth of huge (and expensive) vertical malls, shoulder to shoulder, both sides of the street, with numerous side streets of both high- and low-rise condos. This is where the American Club is. This is where Mike’s “serviced apartment” was during his first weeks here. Apparently this is where all the action is! Where we live near Holland Village, 8-10 bus stops down the road, is more residential. When we left the restaurant, you guessed it, another monsoon downpour. The other ladies went off to get taxis, but I had time to explore. I stayed under the 10-20 foot overhangs that every building seems to have, and just used my umbrella to cross streets. After window shopping, I impressed myself by finding a new bus stop, using visual recognition to get off at the right stop, and making it home through the torrential rain. I felt like a native.